The Fantasy Amateur Page Five Reader and Collector: Lowndes: Now THAT's something more like it. Even if Koenig did take some rather nasty cracks, going on Sykora's word for things. Again tops in the mailing for our money. (Mr. Freehafer omitted comment on this item) Ramblings: Lowndes: Dreary to say the very least. (Mr. Freehafer omitted comment on this item.) Hectoed Matter: L'Oasis d'Horreur: Lowndes: We love Baudelaire. Of course, we can't read French, but we're up enough on translations, and a few fugitive words we've picked up to get the idea of it. Freehafer: An amusing idea, and fairly well done. Nachgemachte Schildkrotensuppe: Lowndes: "Soup of the Evening, Beautiful Soup", we take it--ja? Interestng even if we can't read Deutsch. Freehafer: An amusing idea, and firly well done. Horizons: Lowndes: Again my copy couldn't be read. Strike two on you, Harry. Freehafer: My copy was much more legible this time. Very good, though the Astounding review was a bit lengthy. Lowndes adduces: Mailing as a whole: Improved, we thought. Best liked: Reader & Collector, Milty's Mag, the Time Scanner, Phantagraph, and Le Vombiteur. Special mention to Chauvenet's little mags. We coulda gladly done without: Fantaseer, Ramblings, and Strange Fantasy--Try harder nexttime, lads. (Mr. Freehafer's failure to comment on several items is due to his having misplaced the items in question during a recent change of address) The space below we leave for Milty. . . . 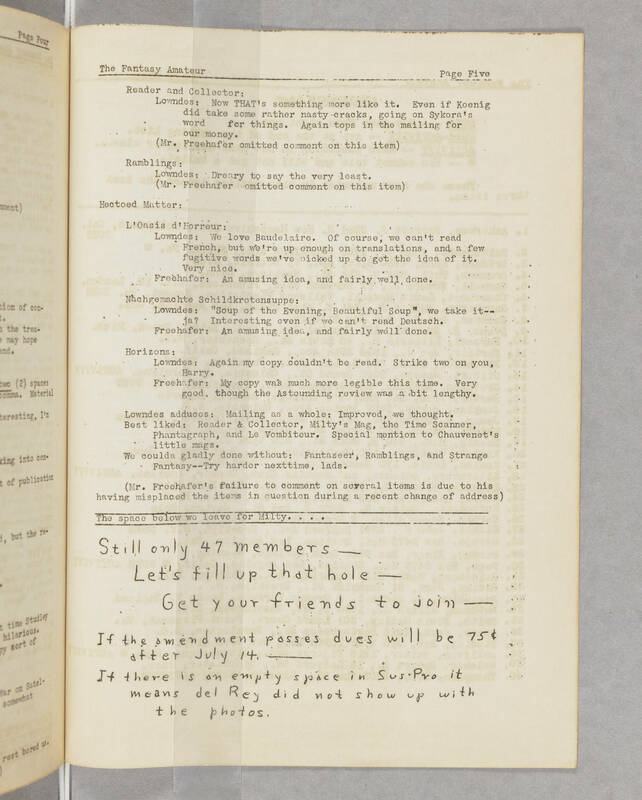 Still only 47 members— Let's fill up that hole— Get your friends to join— If the amendment passes dues will be 75¢ after July 14.— If there is an empty space on Sus-Pro it means del Rey did not show up with the photos.